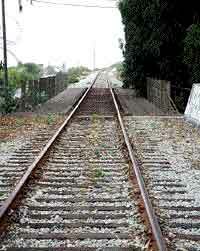 On December 1, 2011, I had the opportunity to videotape and photograph the entire Santa Cruz Branch Line rail corridor. Sierra Northern Railroad set up a flat car in front of a locomotive and allowed me to strap a video camera to the front end. Click here see the one-mile video segments of the scenic 32-mile line. Or, visit our channel on YouTube.